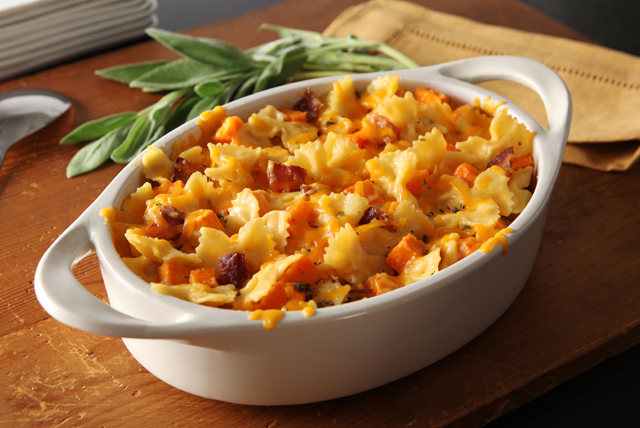 You know they're gonna like it just from the name: mac and cheese, butternut squash…bacon?! We even tossed some fresh sage in there for extra awesomeness. Spread squash onto one side of parchment-covered rimmed baking sheet. Bake 25 to 30 min. or until tender, spreading bacon onto other side of baking sheet after 10 min. Meanwhile, cook pasta as directed on package, omitting salt. While pasta is cooking, heat oil in large skillet on medium heat. Add garlic; cook and stir 1 min. Whisk in flour; cook and stir 1 min. Gradually whisk in milk; cook and stir 3 to 5 min. or until thickened. Add 1-1/4 cups shredded cheese and 3 Tbsp. Parmesan; cook and stir 1 to 2 min. or until shredded cheese is melted. Remove from heat. Drain bacon on paper towels; drain pasta in colander. Add both to cheese sauce along with the squash and sage; mix well. Spoon into 2 qt. casserole dish sprayed with cooking spray; top with remaining cheeses. Substitute 1/2 tsp. dried sage leaves for the fresh sage. Prepare using your favorite shaped pasta and/or winter squash.